In 1909, Allarmelu is nine years old and living a privileged, sheltered existence in Surya Vilas, her family home in the rich, lush environs of Madras in colonial South India. When her mother dies, Allarmelu’s world is turned upside down. On the cusp of puberty and surrounded now by spinster aunts and men, she must find her own way. When she discovers the theft of her mother’s pomegranate-coloured wedding sari, a precious heirloom passed from mother to daughter, Allarmelu vows to track it down. But tracing the sari is fraught and exposes her to new dangers among hidden mistresses, exotic Russian dancers, and incendiary family secrets. A mysterious diary unleashes an epic tale that flashes back to nineteenth-century India and the tortured provenance of the sari itself – sari looms are set alight, weavers murdered, and marginalised communities silenced and oppressed. But the weavers nevertheless leave their indelible mark on history, in woven secrets that will only be revealed many years later. 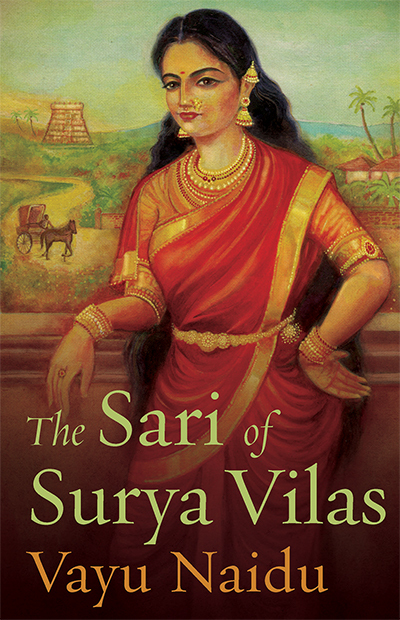 The Sari of Surya Vilas is a poignant story of a woman finding her voice against a backdrop of family secrets, betrayals and promises, symbolic of India’s struggle for Independence. It’s a narrative every bit as vivid, complex and breathtaking as the fabled sari itself.